OXFORD, Ohio -- They had it. The championship was in their hands. Ever heard of snatching defeat from the jaws of victory? Flashback to 2009. The Miami RedHawks were having the most successful postseason in their hockey program's history. They defeated Denver and Minnesota-Duluth to advance to their first NCAA Frozen Four in Washington, D.C., where they would match up against the Cinderella team, Bemidji State. From a fan's perspective, Miami's chances of advancing to the national title game looked pretty good. This had been a 10-year climb for Miami and head coach Enrico Blasi, who had played for the RedHawks and built his alma mater into a national power. In both 2007 and 2008, Miami missed out on trips to the Frozen Four by losing to Boston College in overtime. By 2009, the team was ready to take advantage. They took out their frustration on poor Bemidji State. Unranked, the No. 16-seed Beavers from northern Minnesota had defeated second-ranked Notre Dame (5-1) and ninth-ranked Cornell (4-1) to make the Frozen Four. It was an amazing story. But it was about to end. Miami came out and staked its claim to a championship appearance with a dominating 4-1 victory, setting up a matchup with top-seeded Boston University, which had defeated Vermont 5-4. The tournament, and the season, had become legendary for the erratic nature of the games. "The unlikely field caps an unpredictable season in which powerhouses such as Minnesota, Colorado College and the last three national champions -- Boston College, Michigan State and Wisconsin -- all failed to make the tournament field," wrote Denis Cummings of Dulcinea Media. "Of the remaining four teams, only BU has won a national championship. Vermont is appearing in just its second Frozen Four, while it is the first for Miami and Bemidji State." Miami would be the underdog in the title game against Boston. The Terriers were playing in their 10th NCAA Final -- but the first in 10 years. Still, in this tournament, everyone knew that anything could happen. Boston (34-6-4) was led by the talented trio of Colby Cohen, Nick Bonino and Hobey Baker Award winner Matt Gilroy, as well as 13 players who were drafted by the NHL. They were all shut down by Miami (23-12-4) for almost all of the game. Boston got on the board first and led 1-0 after the first period. But Miami surged ahead in the second, when a Gary Steffes shot was knocked down, and Andy Miele rebounded it and put it in for the tie. In the third period, Miami continued to apply pressure and center Carter Camper fired a shot at the net. Tommy Wingels found it and sent it into the goal for a 2-1 lead. Just three minutes later, with four minutes to go in the game, RedHawks captain Brian Kaufman stole a Boston pass and pushed the puck ahead to Trent Vogelhuber, who wasted no time in putting a wrist shot into the net for the 3-1 lead. Things looked good for the RedHawks. Miami would hold that lead until there was one minute left in the game. One minute. The RedHawks had it. "The RedHawks' supporters in the crowd of 18,512 certainly thought the championship was won at that point. Shortly after Vogelhuber's goal, they unleashed loud chants of 'Yes, we can! Yes, we can!' " chronicled the Patriot-Ledger newspaper. "With only a handful of minutes left, the RedHawks might have been forgiven for thinking those fans were right. 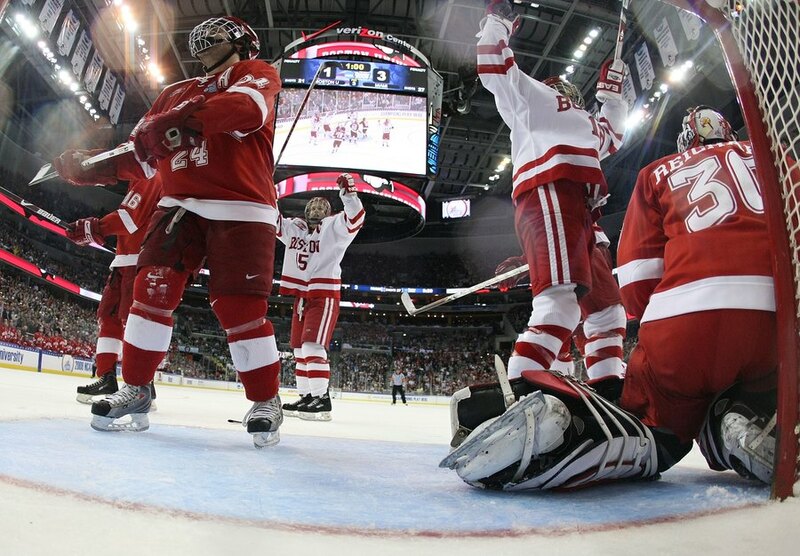 After all, up until then, Miami had allowed all of five goals in the entire tournament." With 2:40 to go, Boston pulled goalie Kieran Millan for an extra attacker. It worked. With a minute to go, Cohen scored to pull the Terriers within one, at 3-2. The game got tighter. Then, with 18 seconds to play, Bonino took a pass from Gilroy and beat Miami goalie Cody Reichard on the glove side to tie the game. Improbably, the game was going into overtime. "Out of the corner of my eye, I saw Nick sitting wide open," Gilroy, college hockey's top player, told the New York Times. "Once we got that, I think the whole bench knew it was ours." Pandemonium ensued, even as many in the crowd were stunned. Boston head coach Jack Parker later told ESPN he had to settle his team down for the overtime period. "This is an opportunity that you probably didn't think you had with six minutes to go in the game or four minutes in the game, and now you've got it," Parker told his team. "Make sure you take the best opportunity here that you've got and do something with it." Charlie LaPlante, a Miami fan living in Minneapolis, was watching on television from his home, laid up with a broken ankle. He later recounted his emotions in a column on ESPN's SB Nation website, Hustlebelt.com. "I'm sure the sense of dread I felt was shared by everyone at the Verizon Center," he wrote. "I saw no way we could win the game in overtime. The roller-coaster of emotions -- we were seventeen seconds away from a national title! -- was too much. And make no mistake: that overtime was not fun to watch. At no point in time did I have the 'good' kind of nervous jitters, a feeling of hope that Miami would get a lucky bounce and hoist a trophy. The only sense of anticipation I had was the horror of awaiting a loss." The wait would go on for more than seven agonizing minutes. At the 11:47 mark, Boston got another break. Cohen hit a blast just above the left circle, and Miami defender Kevin Roeder did just what he was supposed to do: He slid, giving up his body to protect the goal. Instead, the puck deflected off him, and flew over goalie Reichard into the net for the winning goal. "I was just trying to shoot it toward the net and go for a rebound," Cohen told the Times. "I got lucky, I guess." "And then the Terriers were celebrating, raising a trophy that was supposed to go to Miami, completing arguably the greatest comeback in NCAA hockey history," LaPlante wrote. "We RedHawks fans tried to talk ourselves happy in the days afterwards --this was supposed to be our rebuilding year, after all. Wasn't it just fantastic to have made it this far? Next year we're going to destroy the field! -- but it was a futile effort." The loss was so sudden, even a WCPO fan feature could not capture what had just happened. In the video below, Miami fans at bars showed excitement and confidence, not fathoming what would unfold. With the game ending late, the reporter made a matter-of-fact mention of the outcome, not reflecting the dramatic collapse. Blasi, the Miami head coach, explained that bad bounces happen in hockey. "Kevin makes a great play, sacrifices his body, and it goes over Cody's head into the net," he told the Associated Press. "As I told the team, they have a lot of people supporting them not only in Oxford, with the Miami students community, but alumni across the country. And I think I'm pretty sure we've got some more fans in college hockey now. No other team in Miami history has ever gone to a semifinal. No other team has played for a national championship. And we've done that. I think hopefully this is a step for more to come." It was, in a way. Miami would return to the Frozen Four the very next season, but would lose to Boston College. The RedHawks have not been back to the Frozen Four since. And while many of the Miami players went on to professional careers, head coach Blasi is still looking for that first national title. For fans, there may be nothing that can erase the memory of that 2009 heartbreak. "The RedHawks snatched defeat from the jaws of victory," LaPlante wrote. "Miami could win the next 10 national titles starting next year, but nothing will wipe that collapse from my mind."